MOTORHEAD - LIVE AT BRIXTON ACADEMY - THE COMPLETE CONCERT (2CD O-CARD) | Online Shop | Wizard LTD. 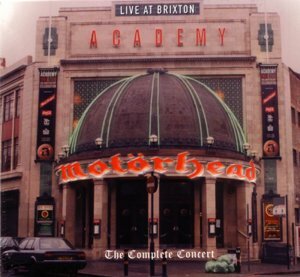 Album: "LIVE AT BRIXTON ACADEMY - THE COMPLETE CONCERT (2CD O-CARD)"
Live at Brixton Academy is the fourth official live album by the British band Motorhead. Recorded at their 25th anniversary concert on October 22, 2000 at the Brixton Academy, London, UK. Various guests made appearances, including Queen&apos;s Brian May and ex-Skunk Anansie guitarist Ace. The concert has also been released as a DVD entitled 25 & Alive Boneshaker. "Fast" Eddie Clarke (ex-Motorhead) on "The Chase Is Better Than The Catch" and "Overkill"
Todd Campbell (Phil Campbell&apos;s son, Psycho Squad) on "Killed By Death"
Paul Inder (Lemmy&apos;s son) on "Killed By Death"
Whitfield Crane (ex-Ugly Kid Joe) on "Born To Raise Hell"
Doro Pesch (ex-Warlock) on "Born To Raise Hell"
Brian May (Queen) on "Overkill"
Ace (ex-Skunk Anansie) on "Overkill"